The WB250F comes with an 18x optical zoom, a 14.2-megapixel backside illuminated (BSI) CMOS and a 24mm lens. The WB200F has the same hardware, except its packing a CCD sensor rather than the CMOS. The WB800F gets a 21x optical zoom and a 16.3-megapixel BSI CMOS. The WB30F has a super-slim 17mm body, which houses a 10x optical zoom and 24mm wide angle lens. The DV150F WiFi camera has a 2.7-inch forward-facing LCD (to improve your self-portraiture), 16.2-megapixel CCD sensor, 5x optical zoom and a 25mm lens. 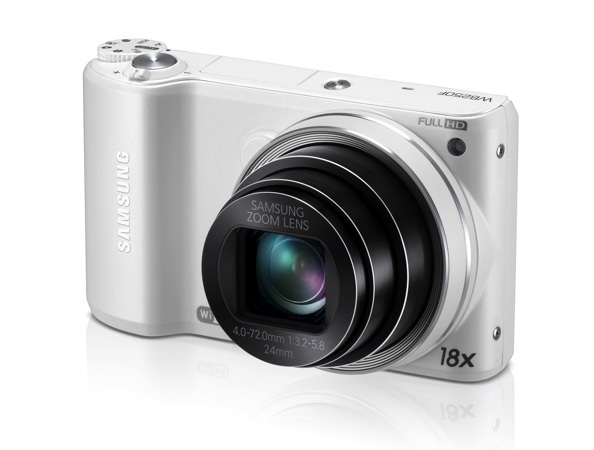 Rounding out the range is the ST150F, which has a 5x optical zoom, 25mm lens and a 16.2-megapixel CCD sensor. LAS VEGAS, USA – January 7, 2013 – Samsung Electronics Co., Ltd, a global leader in digital media and digital convergence technologies, today announced the launch of upgraded SMART CAMERA and the first devices to run on the new technology: the WB250F/WB200F, the WB800F, WB30F, DV150F and ST150F. As new additions to the WB series of long-zoom models, DV series of Dual View cameras and ST series of Style Feature cameras, the new devices combine high optical performance and classic style with the enhanced connectivity of SMART Camera. Samsung has evolved its innovative Wi-Fi technology to enhance its acclaimed SMART CAMERA, originally announced at CES 2012, by creating SMART CAMERA 2.0. New functionalities and upgrades allow users to shoot and share their cherished photography instantly, revolutionizing the connective camera experience and allowing consumers to be in complete control across the breadth of the SMART CAMERA portfolio. The ‘One Click, Simplify’ concept enables connected devices to seamlessly connect so images can be shared flawlessly in one motion through the striking interface. Designed with smartphone users in mind, this interface combines touch-type and big screen functionality, creating faster editing and uploading to other devices and social media sites. Simplified connectivity for the camera user is a reality when using any Samsung camera with Wi-Fi connectivity. The photographer can now experience a connected world, through either upgraded capabilities or when using any of the wireless advantages of the SMART CAMERA’s Wi-Fi connectivity. AutoShare allows images to simultaneously be sent and saved straight to a smartphone, via a Wi-Fi connection, as soon as the photo is taken on a camera. The function is built for busy lifestyles and will automatically become the default setting once set up, allowing back-up and sharing of treasured memories to be stored in an instant. Streamlined connection has also been built into the external design of SMART CAMERA devices with a standalone Direct Link hot key automatically executing on Wi-Fi functionality at the touch of a button. Users can assign their most loved wireless function to the key in advance for superior speed when sharing photographic memories with friends and family anywhere in the world through Wi-Fi connectivity. The unique Samsung SMART CAMERA App. builds on Samsung’s commitment to a connected world and the consumer’s love of applications for an effortless technology experience. This new feature enables smart phone users to download the application (available on both Android and iOS operating platforms) and connect with the pre-installed SMART CAMERA capabilities via a Wi-Fi connection to manipulate, share and back-up images shot across the range of connected Samsung cameras available. Combining three different intelligent elements in one touch, the SMART CAMERA App. integrates the upgraded capabilities of Remote Viewfinder and Mobile Link as well as the new AutoShare tool putting users in control from beginning to end of the connected photographer’s journey. The new flagship camera in the WB long-zoom series makes it easy for users to achieve excellent quality pictures from a camera that is stylish and classic in design. The WB250F (and WB200F) boasts outstanding optical performance to make capturing great photos easy, with 18x optical zoom, a 14.2 Megapixel BSI CMOS (WB250F) or CCD (WB200F) sensor and 24mm lens. Built with a classic design, it incorporates a hybrid touch interface consisting of touch LCD screen and five-way navigational keys, allowing users to manipulate controls to their preference. For photographers that want to make the most of this, a full manual mode option gives complete control over the camera’s settings. To make brilliant photography easy, the new WB cameras also incorporate features such as Best Face, which automatically selects the best facial expressions from a burst shot to create group photos where everyone looks their best, as well as SMART Mode and Motion Photo features, allowing users to achieve pro-standard quality and creativity under any condition. With the addition of Wi-Fi capabilities, users can share high-quality photos quickly and easily. The WB250F is completed with pop-up flash and is available across four stylish colors; white, cobalt black, gun metal and red. The WB800F is a classic long-zoom camera, with 21x optical zoom and a 16.3 Megapixel BSI CMOS sensor for excellent low-light photography. This powerfully performing camera has been built around a hybrid user interface, which allows photographers the choice of controlling the camera via the touchscreen or a five way manual key. The WB800F will be available in white, cobalt black and red. The WB30F is the range’s new ‘mini model’, with the capabilities of a WB model, including 10x optical zoom and 24mm, wide angle lens, in an ultra-slim body that is only 17mm thick. Extra features built into the slim and stylish design include Magic Frame and Live Panorama that allow for an enhanced photography experience. The WB30F will be available in black, white, red, purple and pink. The DV150F combines Wi-Fi connectivity with a 2.7″ Front LCD, making it easier than ever to take easy and creative self-portraits. Perfect portraits can be taken with the DV150F’s Beauty Palette feature which enables users to apply one of a range of make-up looks to the subject of a photo to instantly transform portraits. In addition, a series of creative features such as Smart Filter 3.0, Motion Photo and Magic Frame make it easy to create interesting and unique pictures worth sharing. The imaging technology of the DV150F, a 16.2 Megapixel CCD sensor, F2.5 25mm bright lens and 5x optical zoom, deliver outstanding quality pictures that can then be shared instantly via Wi-Fi. The DV150F is housed in a stylish aluminum body and is available in five different colors including plum, lime green and light pink. The ST150F completes the range of new SMART CAMERA models. With an F2.5 Bright Lens, 5x optical zoom and 25mm lens, taking bright pictures is made easy and a 16.2 Megapixel CCD sensor delivers sharp and clear results. The Wi-Fi connectivity enables photos to be shared and uploaded to social media sites on the move and is perfect as a connected camera for amateur photographers and creative individuals. Available in four colors, it delivers unparalleled ease-of-use to capture and share great pictures. With an F2.5 Bright Lens, 5x optical zoom and 25mm lens, taking bright pictures is made easy and a 16 Megapixel CCD sensor delivers sharp and clear results.